We all work hard and have lots of day to day “things” going on in our busy lives. We need to take care of our money and investments, and we can’t forget to take care of ourselves and the ones we love. 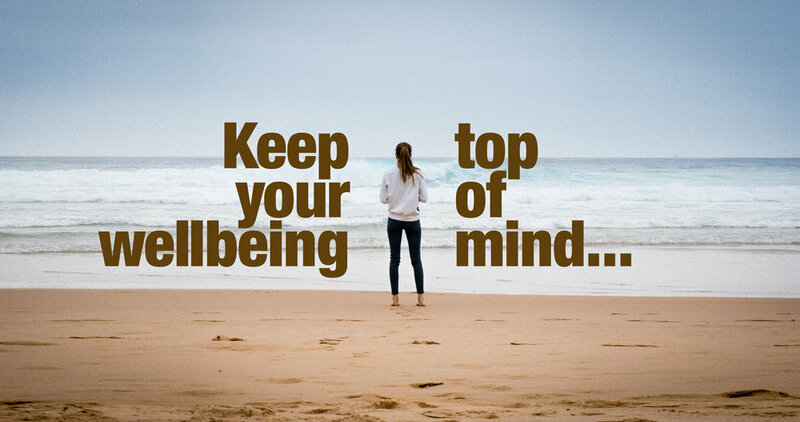 Here are a few rewarding steps towards improving your overall wellbeing. At times we can all be a little too self-critical. Society and culture put on the pressure and sometimes it’s a good idea to cut ourselves some slack. Encourage yourself, and treat you like you would a friend in the same situation. A little self-support can go a long way. More contact with family and friends on a regular basis is better for you than you think. That social connection makes for a great boost overall. There’s always more than one way to look at things. We each give our own meaning and point of view to every situation. Taking a different angle or 10,000 ft view will give you a much more well-rounded perspective. Seeing the bigger-picture based on the grand-scheme of things is always a good idea. Stamp collecting, fly-tying, baking, golfing, knitting, reading… the list goes on and on. Setting time aside dedicated to one of your keen interests or passions is always heathy. You could meet new people, learn new things, boost your confidence and interest. Someone is always in need of help, your community, a charity, or just someone you know. Not only will you do some good for others, but you will feel good about it – and it’s social. Trade in the Big Mac® for a big salad. Sometimes if we feel low, we want to hit the treats and junk food for the instant gratification and fun factor. A healthy clear mind needs healthy clear food. Lots of water, less salt, sugar and fat ­– more fruits and vegetables will work wonders. Keep your sleep at a regular time and length the best you can. Avoid electronics and caffeine before bedtime, unwind with a book or soft music. More alert and refreshed, means clearer thinking. Move. Get up and walk around more during the day. Go outside just for a ten-minute brisk walk each and every day – even if it is just to see how hard it’s raining. Join a gym or try to get a regular exercise routine, take up some more active centric hobbies, walk to work and take the stairs. Just a little exercise goes a long way for sleep, energy, mood, and longevity. Let’s face it we all think we should save more. At times when we think about how much money gets spent on things we don’t need, and look at the things we’ve collected, it’s not hard to see that money has too many easy ways of disappearing. It can be like trying to carry water in your hands. Especially if you don’t stay aware of it more often. Now I’m not saying you should be money-obsessed and make it your all-consuming hobby to scrimp and save every dollar, but we all should take account of our spending once in a while no matter how painful and terrifying it can be. Last year my wife and I took stock of all of our restaurant bills at year-end. It was a sobering experience. After the grand total was established we both looked at each other with a simultaneous jaw drop. Money lost forever with nothing to show for it but a few extra pounds on our waistlines. We all try to practice the “everything in moderation” rule but let’s face it life gets away from us in so many ways and in today’s consumeristic landscape EVERYONE is scientifically masterminding how to get us to willingly part with our hard-earned dollar. So here are a few light-weighted tips that might give you an edge or get you thinking about keeping a few more of those shiny dimes in your pocket longer. Remember, life is about having fun and getting where you want to go. So often we are the ones in our own way keeping us from our dream destinations longer than we should be. When making or planning a purchase a good idea is to give yourself some time to think it thorough. 30 days seems to be the charm. If you are itching to buy something, take some time to cool off before you do. After 30 days of thinking you may decide that there are better ways or better things to spend that money on. Sure, if you still need what you were planning on purchasing you will be more confident with your purchase after waiting. 30 days could save you. Going to the grocery store or a place like Costco? Make a list, check it twice, and stick to it. The temptations of over-purchasing and cart-filling are what retailers bank on. We are bombarded with irresistible offers and temptations at every corner. NEVER go to the grocery store hungry! Once they have you there they want to keep you longer and get you to buy more and more. They lure you in with a sale on ground beef and seduce you to buy much more than you came for. Stick to your list and spend more time on it than you do in the grocery store. Follow Your List. Having lunch or dinner out? In moderation it’s great fun. But tell your server water will do. Most eating and dining establishments hedge their bets on alcohol and soft drink purchases. The average cup of coffee costs an eating establishment about a nickel a cup if it’s the good stuff and they may charge you up to 3-4 bucks for a cup of Joe. Wine and beer are also big players in their profit margins and your debt margin. Water will do in most cases and the savings can be significant. I used to visit Starbucks twice a day for an average bill of $7.50 per day – multiply that by five working days = $37.50 per week = $150.00 per month = $1800.00 per year! Terrifying isn’t it? Have coffee and tea at work or make it before you go and take it with you. Oh how I wish I had that $1800.00 to invest right now. Drink More Water. It’s midnight and you are on your iPad jamming all the things you need into your Amazon shopping cart. You are so excited about all the packages that will come to you this week. You can buy anything online and have it delivered in a day or two. You don’t even have to leave your bed to do it. All you need to do is push that yellow button that says checkout and all your dreams will come true. Oh, how I hate the convenience of technology and things like PayPal. They make impulse purchasing easier than breathing. Take all of your credit cards off of your shopping accounts. Avoid one click purchasing like the plague. If I would of have to get out of bed, turn on the light, go find my wallet, let the dog out, get my credit card, and key it in on checkout every time I would never purchase a thing. Make it harder to buy things and you will buy less for sure. It’s rainy or it’s too hot outside – lets go to the mall and walk in circles until we find something to buy or get hungry and eat. Shopping has become a national recreational pastime. Retailers thrive on this culture and disguise malls as recreational destinations just to get you spending. If you go to the mall go with a list and stick to it. Don’t go because you are bored; shopping should not be a form of entertainment. I know you can buy things everywhere but better if you don’t turn it into a recreational sport. Avoid shopping malls. Sounds obvious right? I guess it is, but we all are creatures of habit. We tend to do the same things over and over including shopping. If a retailer can get you to move to their store it is a big win for them because most people have a pattern of migration and movement they follow without thinking about it. There are three grocery stores within a block from each other, but we continue to go to the same one. We don’t read flyers to see what is on sale - it’s too complicated. We are most likely too busy shopping online. Don’t drive twenty miles to save 10 cents on bread, but shopping around is a big plus. Planning meals for the week around what is on sale is also a great way to save. Watch what you buy online as well. Sometimes you pay much more than it’s worth for the convenience. Shipping charges are not so bad any more, but shipping returns are hefty – buying shoes and clothes online can cost more in return shipping fees if things don’t fit. Shop around. 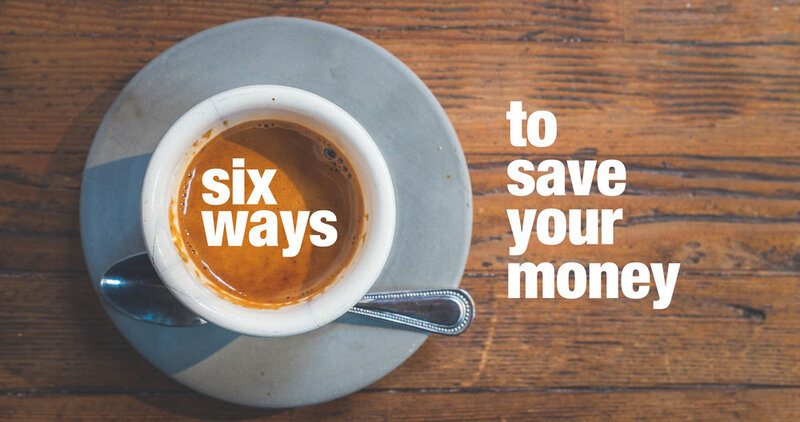 So there you have it, six tips to get you thinking about saving more. Don’t even think of it as saving – think of it as not wasting or losing money. Saving sounds like dieting, its painful, not fun, slow, and too much work. We all need to be smarter and more industrious with our money, why? Because the world is designed to find ways for us to part with it constantly. If you take a few minutes and do some basic math based on your spending habits you might be motivated to find a better way. Hopefully these tips will get you inspired to do so. Above illustrates our new branding as well as our previous positioning. Magnetic Capital Group has evolved its branding and core identity to serve and connect with its clients and customers. We are constantly striving to serve our existing clients and new customers in the best way possible. This means that on an ongoing basis Magnetic will change the way it does things to match the demands and needs of Canadians, and the fast changing financial landscape we live in. Financial literacy, innovation, forward thinking, and service excellence are what we pride ourselves on. You may have noticed that our name has changed from Magnetic Mortgages and Investing to Magnetic Capital Group. We are still very much involved in mortgage acquisitions and renewals, but we have also grown our mortgage investment division. This is the new heart of our business, along with our dedication to financial literacy and education. As we grow, we learn from you our dedicated customers and clients. Thank you for your dedication and trust in us, we promise you years of financial growth and a true pathway to your dreams. We make it easier for you to get there sooner. In 1997, I was a psychology student at York University in Toronto. I had taken a particular interest in Cognitive Psychology as the way people think fascinates me. One particular class centred on the influence tradition has on the way we make decisions, and a debate grew as to whether or not that influence was good or bad for people. As with most psychological debates, a good argument could be made for tradition being good or bad depending on the circumstances in which is was at play. The lecturer for that class was exceptionally passionate about cognition and that passion shone through in her efforts to engage the class. She seemed to stop at nothing to bring context to the concepts we were exploring and when the topic of the influence of tradition came to the fore, she brought it all to life with just one video. The video was a recording of a psychological experiment involving 5 Rhesus monkeys in a group setting under controlled conditions. What it revealed about why the monkeys behave the way they do can teach us a lot about ourselves. More on that later. The 5 monkeys are placed in one end of a long cage, and at the other end is a ladder with a bunch of fresh, ripe bananas placed on it’s top stair. Without much delay, one of the monkeys makes a break for the bananas, but before he can reach out and grab his reward, the experimenters hose all 5 monkeys down with ice cold water. The monkeys retreat to the back of the cage, and the water stops. After a couple of minutes, a different monkey goes for the bananas and the same thing happens. As soon as he gets close, out comes the ice cold water. This happens several times before the monkeys as a group decide to abandon their pursuit of the bananas all together, choosing to avoid pain rather than to pursue pleasure. What happens next is fascinating. Once all pursuit of the bananas has ceased, the experimenters remove one of the monkeys and replace him with a new monkey that has never been exposed to the cold water treatment. The new monkey very quickly decides to go for the bananas – likely wondering what’s wrong with the others – but to his surprise he is assaulted by the other 4 monkeys before he gets close to the ladder and before the cold water treatment is triggered. He doesn’t need to learn this lesson twice and abandons his pursuit of the bananas for good. The experimenters continue to remove one of the original 5 monkeys from the cage at a time, replacing them with new, unsocialized monkeys and each time the same thing happens. The new monkey thinks he’s smarter than the rest and goes for the bananas, but suffers an attack initiated by his peers prior to getting to the reward and the whole group avoids the cold water treatment. Here’s the brilliance of the experiment – when the 5th original monkey is replaced, there are now 5 monkeys in the cage who have never experienced the ice cold water treatment and do not really know why they are participating in the attack of the new monkey pursuing the bananas. If they could talk, and you asked the monkeys why they were attacking the new monkey, there could only be one answer…”I don’t know, that’s just the way it’s always been done around here”. In many ways tradition is a beautiful thing. It brings families together despite busy lives, and it builds memories that last a lifetime. Tradition can help make sense out of our chaotic world and can create legacies we can be proud of. That said, when it comes to our money, tradition is holding us back. Doing things the way they have always been done isn’t getting enough families to their financial goals and it’s time we took a hard look at why we do what we do with the intention to make changes where things aren’t working. At Magnetic, we teach Canadian families something called The Method and the education has become Canada’s simplest, most efficient wealth building tool. The Method will teach the average two income earning Canadian family how to save tens of thousands of dollars in unnecessary interest on their mortgage and build wealth many times faster with security, predictability, and peace of mind. It’s not magic, it just requires a small change to the way it’s always been done when it comes to day to day banking. For years, Canadians have been taught to bank in a way that serves their banks and it has become tradition to invest in the stock market through an advisor where the investor often times has very little control, no security, and pays a high price for the service. While advisors make predictable fees from their participation, investors remain on a cyclical roller coaster of volatility. It just hasn’t worked for enough families for me to believe it’s the right way to continue doing things. That’s just my opinion. The Method isn’t for everyone. It’s a tortoise like path to building wealth where nobody gets rich overnight, but everyone sleeps well at night. I’m a big believer that stress kills more people than Big Macs (TM) and money worries cause a lot of stress. If you take some time to learn The Method, it will become easy for you to identify and get on the path of least interest with your mortgage and build predictable wealth through secured investing in real estate. It’s not too good to be true, but it sure is too good to be tried if what you are currently doing isn’t working. You can visit our website – www.magneticmi.com – to learn a little bit more about The Method, but the website won’t teach it to you. For that, you’ll have to attend one of our complimentary, live catered workshops in and around the Greater Toronto Area or contact us to set up a webinar with one of our licensed professionals who can teach it to you from the comfort of your own home. Once you understand the concept, we offer a complimentary financial optimization assessment that will show you what is possible for you based on your current financial circumstances. People always ask me “what’s the catch”? and I always tell them the same thing. The catch is simple, if you like what you learn, feel it’s easy enough that even you could do it, and the assessment gets you excited about what is possible, then Magnetic will help you facilitate the implementation of your new financial plan. Full disclosure – At Magnetic, we are very committed to improving the overall financial literacy of the Canadian consumer and all of our education is free. That said, we are a business and in order to keep the lights on and doors open, we need to drive revenue somehow. We believe in attraction (hence the name Magnetic) and that giving starts the receiving process. We also believe that like us, time and money are your biggest assets and if we can make a positive and significant impact on yours, then you might be attracted to our organization as a lifetime client. It’s simple really. We are a licensed mortgage brokerage and we teach people how to efficiently manage their mortgages. The first step in managing a mortgage efficiently is getting the best possible mortgage product. We facilitate that for our customers and the bank that wins the business pays us a finders fee to do so. In addition, we help people lend their cash, registered funds and home equity with security and predictable, fixed annual returns as part of an overall secure, wealth building plan. When we lend money for our customers, we charge the borrower a fee. In then end, our customers never pay us for the services we provide them. If there is a genius to our business, that is it. I hope the monkey experiment resonated for you, and that if your finances aren’t where you’d like them to be I have given you hope that there is another way, and it may be easier than you think to get where you want to go. In most cases, we don’t have an income problem, we have a management issue that can be solved with education. We’d like to be the ones to teach you and I promise – it’s simple enough that even a monkey could do it. Check out our media section to learn more about The Method. Do Your RRSPs Have Performance Issues? Canadians have discovered how to grow their RRSPs three times faster than expected with less risk and no fees! Your RRSP may not be famous for it’s elite performance to date, but you can fix that moving forward with RRSPperform. The RRSP may be the most misunderstood wealth-building tool available to the Canadian consumer today. If you were 40 years old and had $50,000 in your RRSP today, it could be worth more than $300,000 by the time you reach retirement and it’s remarkably easy to do. Here are the 3 things that can hold you back and some free advice about how to break free. 1. There is over $600 billion of unused RRSP room available amongst 22 million working age Canadians from coast to coast. That’s almost $30,000 per adult Canadian of unused room. Do you know how much unused room you have? It would be good to check – and you can do so quickly by looking at your last notice of assessment (the paperwork that came with your tax refund cheque attached to it). This unused room is a pay cheque waiting to happen. If you make more than $28,000 per year, using up your unused contribution room could net you a tax return of $9,000 or more this year! 2. Most people don’t really understand how contributing to an RRSP works and what the benefits really are. Do you? I mean, if you had to rate your own knowledge and understanding of the RRSP on a scale of 1-10, how would you score? Knowing is half the battle, so here’s what you really need to know. You can contribute up to 18% of your gross annual income to your RRSP every year and if you don’t use up the whole 18% each year, the unused portion carries over to the next year so you can always catch up later in life using equity from your home, or cash savings. As far as tax implications go, understanding your RRSP is simpler than you might think. a. Every dollar that you contribute to your RRSP reduces your taxable income for that tax year by a dollar. If you are in a 40% tax bracket, that means that every thousand dollars you contribute to your RRSP increases your tax return by $400. b. Once your RRSP contributions are invested, every dollar they earn is tax-free until you decide to liquidate them. If you wait until you are retired to take the money out, you will likely pay much less tax on it than you would today. 3. Too many Canadians are investing their RRSPs the way it’s always been done, despite clear evidence that the way it’s always been done isn’t working. If you survey enough Canadians on the things that matter the most to them when investing for retirement, the following 3 answers will establish themselves as the most popular. Here’s the disconnect. For decades the most popular investment choice for Canadian RRSP holders has been the mutual fund. All mutual funds are unsecured, the average annual return is nothing to write home about, and mutual fund companies in Canada charge investors some of the highest set-up and management fees in the world to participate. So why are we doing it? There could only be one reason – a lack of quality alternatives that are easy to understand, safe, consistent and highly profitable. RRSPperform is quickly becoming the consumer’s first choice for hassle free, consistent growth in the RRSP arena, and why not? With RRSPperform you’ll enjoy a fixed rate of return of no less than 9% per year with bank grade security, and absolutely no set up or management fees to play. It’s practically RRSP heaven, and getting started is a walk in the park. At Magnetic Mortgages and Investing, we have a team of fully qualified and licensed professionals waiting to take care of everything for you. All you need to get started is a reasonable degree of dissatisfaction with whatever your RRSPs are doing now, a statement of your current RRSP holdings and the initiative to reach out and let us know you’re interested. For more detailed information about RRSPperform, you can call the RRSPperform service line at 416-294-2756 and speak to someone qualified to answer your questions. Nothing is more frustrating than a flaccid RRSP, we get it. There’s no magic pill to fix one, but if there was it would be called RRSPperform, it would be little and it would be blue. Most people are more comfortable with unhappiness than they are with uncertainty. Your attachment to the way you have always done things can hold you back in many ways, and what follows is an attempt to show you a better way to build wealth. Knowing there is a better way is the seed of a brighter future and I’m about to plant it in your financial garden. We are creatures of habit and many of us are comforted by the status quo even when it fails to serve us. Consider how many people you know who are currently committed to unfulfilling relationships but can’t seem to build the courage to leave, or those around you that lament the negative side of their job every day but continue to show up every Monday. It’s no different when it comes to making financial investment choices. Most Canadians are not getting what they expected from their investments but continue to make the same choices anyways. We tend to do things the way we have always done them, not necessarily because they are working for us, but more-so because we fear the unknown that comes with change. Mutual funds are a trillion dollar industry in Canada and they are Canadian investors’ most popular choice, especially for RRSP investing. They are unsecured, the average annual return on investment is very low, and Canadian dealers charge some of the highest management fees in the world. Hardly the kind of defining characteristics that seem in line with the objective of investing if you ask me. The only people that are consistently building wealth with them are the dealers and agents selling the funds. If you are like me, you went through something close to 20 years of schooling (primary, secondary and post secondary) and at no point along the way was it mandatory to engage in a course with a title akin to “How to manage money in the real world”. Most of us learn to manage our money from a parent or other family member and for the most part, we are all just trying to figure it out as we go. It can be overwhelming to try and get ahead financially while dealing with the rigours of the real world and as a result, most people find it easier to simply do what everyone else is doing. The future consequences are far reaching when what everyone else is doing isn’t working, which is the case with mutual fund investing. When putting money away for retirement the things that matter the most are security, predictability, and consistency. As long as you start putting money away at a reasonable age time is on your side, which means you can employ a “tortoise like” approach to investing and build significant wealth with peace of mind. You also don’t need to make unreachable rates of annual returns to get there. The average Canadian has a net worth of $140k by age 40. With an average annual return on investment of only 8% that money would grow to over $1 million by retirement age (65). Guess who doesn’t buy mutual funds, but makes a lot of money? Your bank. Mine too. Banks don’t buy properties, rent properties, or flip properties but they sure do invest heavily in real estate. In 2009 amidst the global financial crisis, Canadian banks made excellent profits across the board and at their core is the practice of lending money, primarily secured against the real estate we own. It’s an incredibly predictable, consistent, safe way to invest. The average default rate in Canada for residential mortgages is less than one half of one percent. Many Canadians choose fixed rates and the norm is to commit to a rate and payment for 5 years at a time. Pretty comfortable deal for the bank, no? Predictable interest payments for 5 years and an asset of greater value than what they lent you protecting their investment “just in case” you don’t fulfill your end of the deal? Outstanding. If I asked you to lend me $1,000 and I offered to pay you back $1,100 in a year, would you lend me the money? You would be wise not to and the reasons make a lot of sense. There are important questions to be answered first. Despite the rate of return being good (10%), what is your security? What assurances do you have that I would pay you as agreed? Even if I could show you evidence that I have made good on my debts in the past (credit report) and show you proof that I have the ability to pay you back (income), how would you insure my “intent” to pay you back? To insure my intent to pay, there must be a serious consequence written into our agreement that I would face if I (for any reason) neglect to pay you back. If I offered to give you the keys to my Cadillac Escalade to hold until I made good on my promise to pay you back as agreed, that would likely change things for you right? Not only would it then make sense to lend me the $1,000, but there might even be an evil little voice in the back of your head hoping that I don’t pay you back as agreed in which case you would be the proud owner of a vehicle worth many times more than the amount of money you lent me. Lending money is the most consistent, profitable way to build wealth but security is the key to making it work. It’s easy to invest in real estate and earn fixed annual returns of at least 8% per year (more often upwards of 10-12%) without taking on the headaches that come with being a landlord. Just like the banks do, you can enjoy predictable returns for terms of up to 5 years and the peace of mind that comes with having collateral of greater value than your investment amount to secure your position. Perhaps the best thing about investing in mortgages is that the borrower pays all of the applicable fees so when your rate of return is written as 8%, you will earn every dime of the 8%. Investing in mortgages is simple and hassle free. It’s a “set it and forget it” proposition and the only thing that stands in the way of you reaping the benefits is your willingness to venture out of unhappiness and into uncertainty for long enough to get all of your questions answered. Copyright © 2017, Magnetic Capital Group Inc.